Organized in Galveston, Texas, in September of 1861, the regiment’s first commander was Colonel John Creed Moore. Formed to protect the coast of Texas from Federal invasion, the regiment completed its training in Houston at Camp Bee. Originally mustered into Confederate service wearing Federal dark blue uniforms, the regiment was transferred to Corinth, Mississippi to become part of the army commanded by General Albert Sidney Johnston. In March of 1862 the regiment received its new uniforms from New Orleans made of undyed penitentiary cloth, which caused quite a ruckus amongst the men. “Do the generals expect us to be killed, and want us to wear our shrouds?” they asked. Left with little alternative, the regiment donned their white uniforms and shortly afterwards left Corinth for the coming great battle at Shiloh. For their efforts, General P.G.T. Beauregard gave the honor to the regiment of allowing them to inscribe “Shiloh” on their battle flag. And for his gallantry, Col. Moore was promoted to brigadier general, and Lt. Col. William P. Rogers was elevated to colonel and placed in command of the Texans. Another honor was given to the Second by being designated the “sharpshooter” regiment of the General Moore’s brigade. That meant the regiment was given the distinction of leading the brigade in all attacks, and covering any withdrawals or retreats. Hereafter, the Second Texas Sharpshooters became their preferred designation. 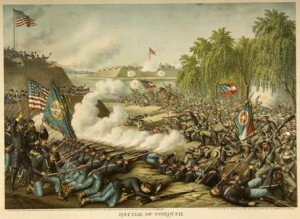 Colonel Rogers led the regiment in an attack on Battery Robinette at Corinth in October of 1862, in which the regiment suffered heavily and Colonel Rogers was killed after briefly capturing the position. Union General Rosecrans ordered that Rogers be buried with full military honors near where he fell for his bravery. The Texans then found itself in the Vicksburg Campaign the following summer, now under the command of Col. Ashbel Smith. The Second again distinguished themselves in battle in the defense of Vicksburg, withstanding two Federal assaults of brigade strength against what came to be known as the Second Texas Lunette. After the surrender of Vicksburg the regiment was paroled to Texas as prisoners of war, being exchanged in November of 1863. The Second, decimated by its service in Mississippi, could hardly muster more than several under strengthed companies. It was never restaffed, but carried its regimental designation through the end of the war. The men were assigned to guard the port at Galveston, and participated in its last skirmish at Caney Creek, Texas, in 1864. Nearing the end of the war, the remaining men of the Second Texas mutinied rather than face surrender, disbanded, and returned to their homes in May of 1865, without having to formally surrender to the enemy.